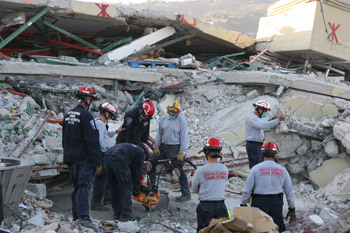 On Tuesday, January 12th, 2010, a 7.0 magnitude earthquake lasting 35 seconds struck the nation of Haiti near the Capital of Port au Prince at 4:53:10 PM (EST). Early reports indicated numerous casualties, extensive damage to buildings and infrastructure, as well as evidence of trapped victims. Hospitals and local government were also affected, severely impacting local response capability. 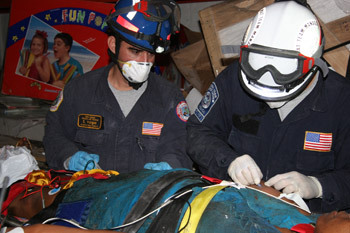 The City of Miami’s Urban Search and Rescue team was activated at 13:45 on January 13th, 2010. Our 80 person team is comprised of a diverse range of disciplines. 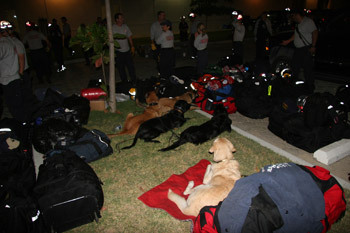 We have canine teams assembled to find survivors, engineers experienced in assessing earthquake damage, firefighters trained to do the hard work of burrowing within the rubble to rescue trapped victims, doctors and paramedics practiced in treating sick and injured collapse victims, as well as a full supporting logistics and management team. In addition, four Haitian Creole speaking firefighters were deployed to assist with translation. 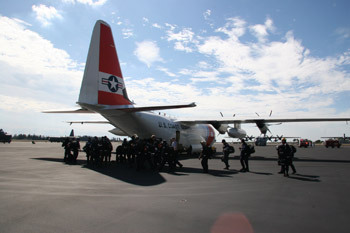 After working through the night to roster a team and prepare the Logistics cache for air transport, the team arrived at Homestead Air Force base at 0700 hours on January 14th for transport to Port au Prince on Coast Guard C130 cargo planes. In the chaos of the earthquake’s aftermath, it took numerous flights to ferry all of our equipment and personnel onto the island. A total of five flights were needed to complete the transfer and the team was forcibly split with little ability to communicate effectively. We were finally able to come together on the evening of January 14th at the American Embassy in Port Au Prince. Our camp was set up in the parking lot of the American Embassy late that evening. On the morning of January 15th, the team was split into 2 teams, Alpha and Bravo, working around the clock pulling 12 hour shifts. 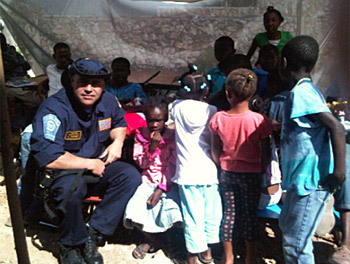 Team Alpha was immediately assigned to search sectors outside of Port au Prince by the United Nations Command, while Team Bravo was allowed to stand down and rest. The rest was short-lived, a call came from another task force asking for help to rescue a victim trapped in the rubble of a small school. Team Bravo was hastily assembled and traveled to a high-hazard area away from the center of town. After a quick assessment, the team began the arduous task of furiously digging to reach the trapped survivor while being careful not to upset the rubble and cause a total collapse, killing the survivors as well as the rescuers. At 0300 hours on the morning of January 16th, after six hours of digging through the rubble, Team Bravo completed the rescue of a live victim from the pile. A task made more difficult by the need to amputate the survivor’s arm with a construction saw. A second survivor was freed in remarkably good condition and was able to walk away with a family member. The last victim at that site was deceased when reached by the team. On January 17th, at 2:00 in the morning, our team gathered information from a family in Miami who were desperately texting for help to anyone who would listen. Using information from these text messages, we deployed a reconnaissance team to the Caribbean Supermarket in downtown Port au Prince. With the help of the supermarket’s manager, numerous survivors were identified and located by their audible cries for help. Again with little rest, this time Team Alpha was deployed to meet the reconnaissance team and began the assessment of survivor locations, as well as, what was needed to reach them. This turned out to be a much more difficult rescue than at the school. This building had been five stories tall, yet was reduced to a little bit more that two stories of ragged concrete slabs, crooked steel and choking dust. Somehow occupants had made it through the earthquake trapped but still able to survive. It being a supermarket, food and water was readily available for those who could reach it. 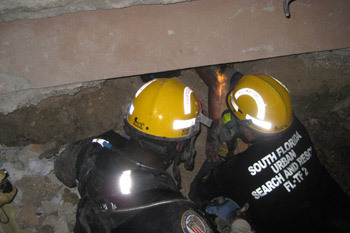 Digging by hand, using hand tools to move debris and to open holes for access, the first rescue was made after 32 hours. At 7:00 AM, a 50 year old female US Citizen was removed who, coincidentally, lived within close proximity of the first rescuer to reach her. 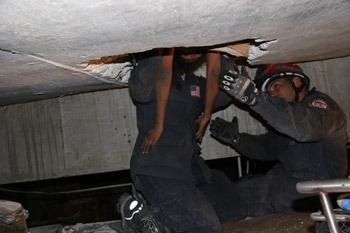 Twelve hours later, a thirty year old Haitian female and a 40 year old male were also rescued from the rubble. Extensive search operations continued, employing all assets available (listening devices, canines, hailing, even heavy equipment) but no additional survivors were found. Instead of resting, after more than a week of non-stop demanding, nerve-wracking, and extremely emotional work, the team seized the opportunity to conduct several Good and Welfare visits throughout the city. 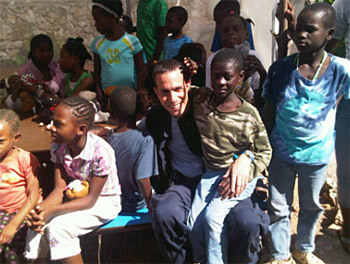 Most notable of these was an orphanage that a task force member had identified. Having completed both rescue and humanitarian efforts, an exhausted but emotionally fulfilled team was transported by way of charter bus 300 kilometers cross country to the Dominican Republic’s Capital of Santo Domingo for an overnight stay. The following day, we arrived in Miami to the relief of eagerly awaiting friends and family. Print, television, and radio media were also in attendance, eager to hear every detail of our experience. The City of Miami’s Urban Search and Rescue Team (Florida Task Force 2) is proud to have represented the City of Miami, the South Florida area and its participating agencies and derived great satisfaction from being part of such a historic lifesaving and humanitarian effort.